If you’re looking for style and versatility you’ve found it. MT-CDM501UCR is a feature packed head unit that typifies the Mutant brand – Dynamic, affordable car audio for the discerning ICE fan. 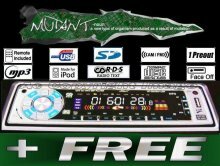 Mutant MT-CDM501UCR Features include SD & MCC Function enabling the user to play music directly from Memory cards, Flip down Dispatchable panel and RDS FM/AM Radio with Digital anti-shock and Remote as standard. 4 x 25 Watt RMS. AUX Input & RCA Output. Please note this unit can only support MP3 with U disk and SD card. Lets you program the clearest frequency easily with one-touch preset buttons. Uses iPod nano's LCD display for tuning. Features single-touch, programmable preset buttons. Includes Auto Power Cord to power and charge your iPod nano's in the car. Operates on multiple FM channels from 88.1MHz-107.9MHz. iPod LCD Display Uses iPod nano's LCD display for easy tuning. Channel Up/Down Scans through multiple FM channels 88.1MHz-107.9MHz. Programmable Memory Slots Toggle easily with single-touch. Now you can use your iPod to listen to your favorite tunes through any FM stereo receiver. The TuneFM Transmitter for iPod nano 2nd and 4th generation wirelessly connects your iPod to your car, home, or portable stereo quickly and easily. Just plug the TuneFM Transmitter into the dock connector on your iPod nano 2nd or 4th generation, tune your stereo to any clear FM frequency, and enjoy your iPod music with full sound and fewer wires. Compatible with Ipod Nano 2G, 4G, 4G Nano Chromatic. In 2006, Belkin TuneFM was Honored with iLounge's " FM Transmitter Of The Year " Award. iLounge lauds Belkin’s FM Transmitters for “positive out-of-box experience”. Most people who buy iPod FM transmitters need them for in-car use, but some people really require portability. TuneFM’s brilliance is that it doesn't force you to choose: unlike its competitors, you get a great-sounding, international-spectrum FM transmitter—no simple feat itself—and a detachable car charger in one reasonably priced package, the best bundle we’ve yet seen for today’s iPods.